Gluck says she loves starting with a white tablecloth because it really makes all the pieces on a table pop. A white background also allows for a great variety of accent colors. “The particular occasion dictates the color story of my table,” she explains. “My house is a palette of neutrals, which I love because they don’t clash with anything! I have a lot of different directions I can go with color. For the holidays, I love golds and crystal. In the summer, I tend toward neutrals and pastels.” Gluck has colorful and patterned napkins for every occasion. Plaid for fall and winter, linen for spring and summer, and a variety of other colors and designs to fit all seasons. “I always make sure that the napkins are machine washable prior to buying. And, for a more formal event, I make a special effort to iron them so that they are extra crisp and look brand-new each time I use them,” she adds. Details, like ribbons, menu cards, straws, and table runners, add individuality and personality to a table design. “I am obsessed with Etsy.com because you can have ANYTHING custom-made by one of their artists/crafters,” says Gluck. “I have had custom menu cards made for the holidays. I love to put them on each place setting and hear the guests discuss the menu.” She adds that another great source is Minted.com, with a wonderful selection of invitations, menu cards, tags, and table runners. 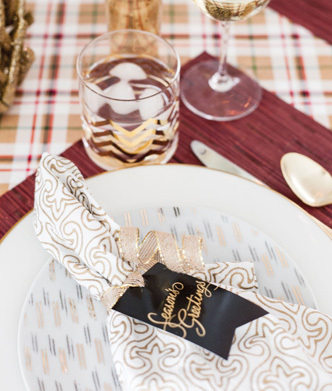 Printed tags make great one-of-a-kind napkin rings. Although there is plenty of opportunity to purchase custom pieces, you shouldn’t need to buy all new items for each holiday event. “I am always finding unique ways to mix and match my dinnerware and glassware so they look fresh,” says Gluck. 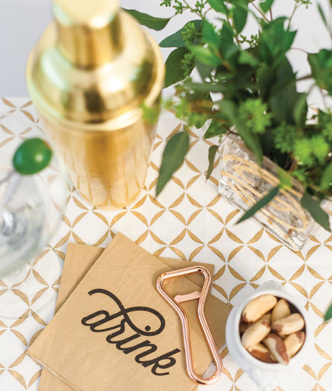 “An inexpensive approach to make a table appear up-to-date and exciting is to buy a fun new napkin in a bright color.” Right now Gluck admits she is on a gold-rimmed glassware kick. “My favorites are Olivia and Oliver at Bed Bath & Beyond. But I also have a beautiful wineglass that I will forever love—my Juliska Amalia glasses that I received for my wedding,” she adds. 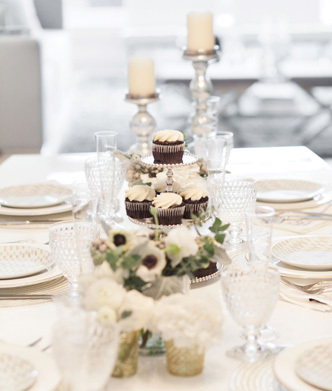 If you’re stuck on centerpieces, try Gluck’s winning mix of flowers and tall candlesticks. “For flowers, I’m all about DIY,” she explains. “I buy three different types of flowers and stagger them in vases of varying heights.” Artificial garlands, gold and/or silver accents, crystal vases, or decor items—all add a touch of sparkle and holiday happiness to a table. 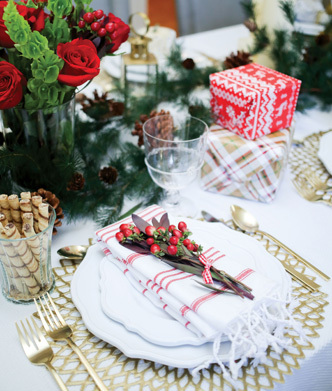 See examples of her varied tablescapes and more of her sage party advice on her blog. A little homework, combined with a basic design plan that can be set in advance, provides the foundation for a simple and lovely holiday table. Employ a few touches of color, a couple of your favorite decorative pieces, and a custom item or two to add your personality to the decor for your next dinner party. Written by Carolyn M. Runyon. Photography provided by Lindsey Grace of Wild Native Co., and Alexandra Wolf. Information deemed reliable but not guaranteed. All measurements are approximate. Copyright 2016 By Design Publishing. All rights reserved.